The Mi Mix 2S is on its way, but two separate reports are here to spoil the surprise with some revealing information about the nearly bezel-less smartphone. One includes a photo from Weibo, while the other dishes out software and hardware tidbits about the handset. 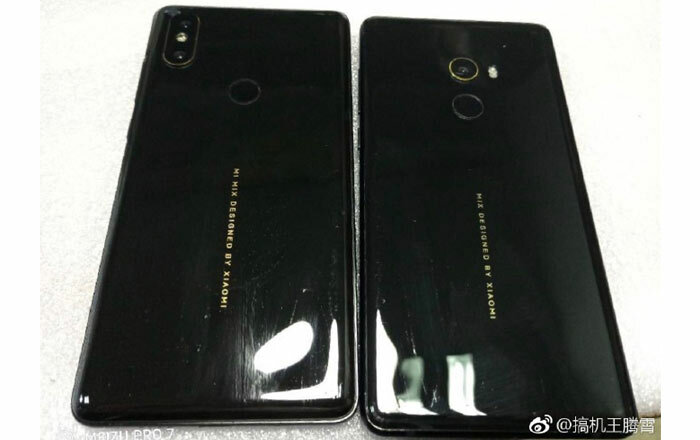 Starting off with the image above, the Mi Mix 2S (left) appears alongside the original Mi Mix 2 (right). The biggest design change is the shift in the camera. The former has dual lenses positioned vertically on the top left edge for an iPhone X-inspired look, while the latter has a single snapper at the center. The fingerprint sensor stays put in both. XDA Developers reports that the Mi Mix 2S’ dual camera module will be bundled with AI smarts. It’s basing this on the firmware files it obtained recently. The lines of code also revealed that the selfie camera will be placed at the bottom like before, eschewing rumors that it would be travelling to the top right corner. The site also found video evidence of wireless charging. The same explanatory video was found in the depths of the Mi Max 3’s firmware files, so it seems to be a generic video made to explain how wireless charging works on Qi wireless charging pads. The device is a match for the Mi Mix 2S, as indicated by the placement of the front-facing shooter. Finally, it seems Xiaomi is going to embrace Google’s ARCore platform with the Mi Mix 2S. The software makes way for AR experiences, so it looks like that’ll be one of the focuses of the smartphone when it debuts on March 27.